Like many Canadians, I grew up watching some, ok a lot, of US network television. I admit that there wasn’t a great deal of educational value there. Perhaps an episode or two of School House Rock that told me what conjunctions are, but not much more. Now that Saturday morning cartoons don’t dominate my schedule, although I can’t pass on the Simpsons, those “educational” experiences are less overt. But they still come up on occasion. One such occasion happened a few years ago during the US mid-term elections. It just so happens that the US network stations that we get here in the Nation’s capital herald from Detroit. We Canadians were bombarded with campaign commercials from any number of candidates seeking seats on the US Congress or US Senate and perhaps even a few seats in important places. Of course I can’t recall any of their names, nor tell you who won the important jobs. I can tell you what struck me most was the commentary from the many autoworkers that lent their support testimonials in the TV ads. Most of these people were supporting particular candidates for helping provide funds to keep their particular automotive plant open. It struck me that perhaps these hardworking people would have been better served by funding training programs to prepare them in today’s evolving job marketplace. The recent turmoil in the US automotive industry, personalized by the Oscar nominated HBO documentary “The Last Truck” suggests that perhaps more could have been done to better prepare these communities for the Digital Economy. Let’s keep a close eye to make sure we really learned this lesson. I’ve been thinking a lot lately about open government and greater citizen engagement in the machinery of government. Local governments have had the most success in reaching out to their communities and getting greater involvement from businesses and individuals in local affairs. This is partly because of the far larger number of daily interactions that we have with our city services. If you think about it for a minute you appreciate that many of those things that you see during the day, like tap water, electricity, public transit, traffic lights, trash collection, public pools, local policing, restaurant health checks and more are all city services. On any average day it seems that we take advantage of well over 10 city provided services. It’s difficult to think of many provincial services over and above health, driver’s licensing and outdoors. It’s even more difficult from a direct federal government interaction, perhaps passports, citizenship and RCMP. So how do we get better citizen engagement across the three levels of government when the interaction between the jurisdictions is so different? One common “service” across all governments is tax: municipal, provincial and federal taxes. Maybe there could some way that we could encourage greater citizen interaction in the allocation of taxes to government programs. Maybe taxes could represent a catalyst for Canadians to give their 2¢ worth of input. 2¢ is hard to subdivide across multiple programs, so let’s up the ante a little and suggest that we use $20 as a baseline. 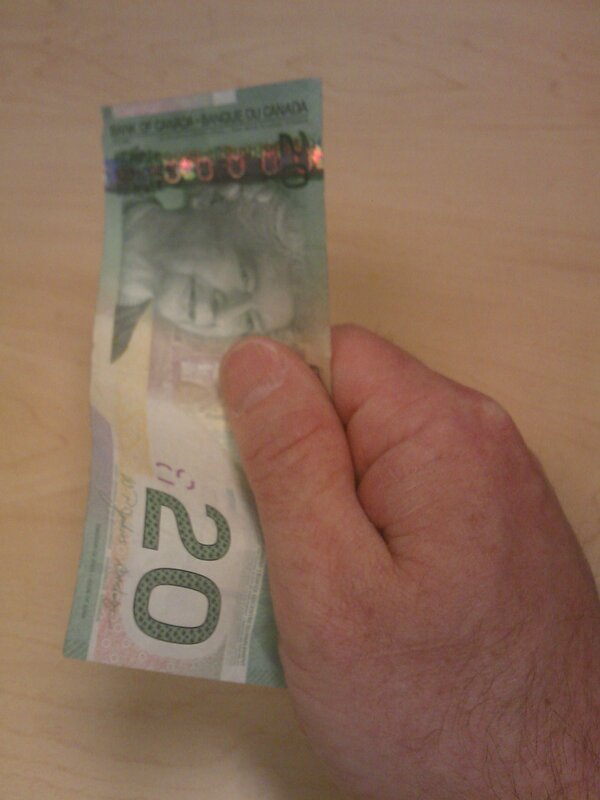 Since Statistics Canada states that average personal taxes amounted to $14,600 in 2008, (http://www.statcan.gc.ca/daily-quotidien/091218/dq091218b-eng.htm, $20 represents less than 0.14% of the total tax bill. I’m sure CRA probably won’t mind that 0.14% is being put aside for this project. Here the concept: Give every taxpayer a notional $20 that they can allocate towards discretionary projects (that is, projects other than essential services (core policing, clean water etc.)) Over top of a regional map, let people select programs that interest them from a pull down list of government funded activities. For each activity, allow people to allocate from $1 to $20 of their notional fund towards each project. So tax payers could, for example, allocate $5 towards a coffee shop in Khandahar for the troops, $5 for maintaining their local outdoor rink and perhaps $10 for improvements to the 400 series highways. At the end of the selection period, the governments could tally the value, truncate those activities that didn’t receive enough support to reach their minimum goals (it would be hard to build an off ramp with say $100). The unallocated funds could be re-distributed in a prorated manner based upon support received to date.